General Landscape Uses: An accent flowering shrub in sunny locations. Also an effective and colorful addition to spiny barrier plantings. Ecological Restoration Notes: It can be used in low densities as an understory shrub in pine rocklands, but can quickly overwhelm small spaces. Availability: Grown by a few native plant nurseries in South Florida. Available in Fort Myers at All Native Garden Center and Plant Nursery (239-939-9663). Description: Medium shrub with long zigzag branches armed with stout pairs of stipular spines. Leaves thin and feathery, light green. 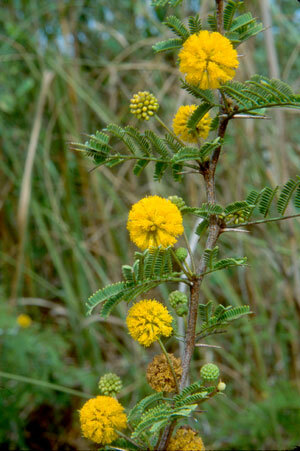 Similar to Vachellia farnesiana var. farnesiana but generally smaller in all respects. Dimensions: Typically 3-6 feet in height; rarely to 10 feet or more. As broad as tall or broader. Range: Monroe County Keys and Miami-Dade, Collier and Lee counties; disjunct in Pasco and Hernando counties. In the Monroe County Keys, disjunct from Key Largo (where very rare) to the pine rocklands of Big Pine Key and nearby islands. 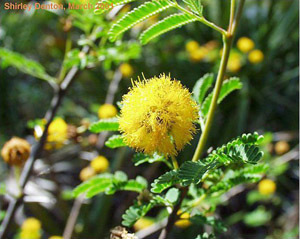 Apparently planted outside its historical range in Broward County and perhaps escaped from cultivation there. Habitats: Pine rocklands, marl prairies, coastal berms and shell mounds. Soils: Moist, well-drained limestone or calcareous sandy soils, without humus. Nutritional Requirements: Low; it grows in nutrient poor soils and can fix its own nitrogen from the atmosphere. Flower Characteristics: Showy, in rounded head-like clusters; very fragrant. 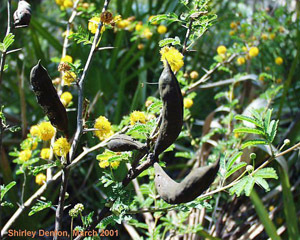 Fruit: Long brownish 1-3" pod (legume) with a pronounced, curved tip. Wildlife and Ecology: Primary larval host plant for nickerbean blue (Hemiargus ammon) butterflies. Key deer browse the foliage in the lower Florida Keys. Horticultural Notes: Propagated by seed and cuttings. Germination may be speeded up by treating seed with hot water. For cuttings, intermediate (not green, not mature) wood is best. Comments: An excellent shrub in sunny locations in rockland and other calcareous areas. The spines make a very effective barrier.